Original blind-stamped brown goatskin with bosses and clasps. Purchased by Curt F. Bühler in Aug. 1959 from Georges Heilbrun, Paris (Cat. 15, no. 189). 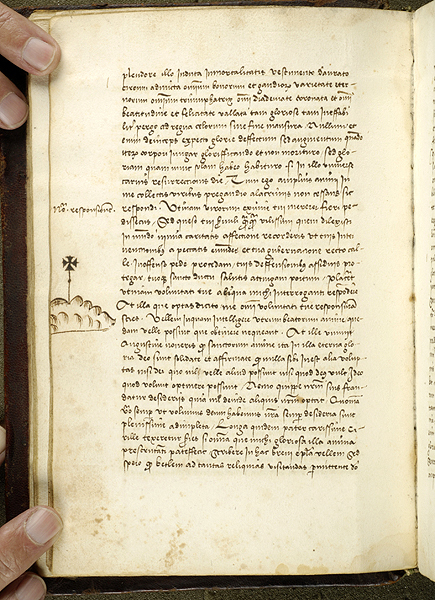 Ms. written in Spain; transcription completed on February 27, 1461. Texts: Prester Jean, Letter to Pope and King of France, in Catalan (fol. 1v-6v); Pseudo-Cyril, De transitu et miraculis Beati Hieronymi (fol. 7-75v); Pseudo-Augustine, Soliloquia (fol. 76-115); St. Bernard, Consideratio claustralis (fol. 115-24); Pseudo-Bernard, Meditationes (fol. 124-130v).